The St. Olms Canal North-Two is the residence of the Faryon family accessed from outside and located on the Canalworks level in the northern part of the St. Olms canton in Vivec. A lot of space in corners and shelves is occupied by a variety of containers, such as sacks, barrels, baskets or crates, most of which contain random ingredients or cheap food, while the others are empty. The only exception to this is a barrel in the southeastern corner, which contains up to 5 gold (60% chance each) and has a small chance of containing random special and marksman loot. Opposite the entrance door, along a wall, is a dresser containing random common clothing, on top of which lies a common shirt with a matching skirt and a pair of pants. Right next to the door, resting on the middle shelf, hidden behind several cups, are a total of 15 gold coins. The bedroom to the southeast offers two beds, both owned by Inera Faryon. 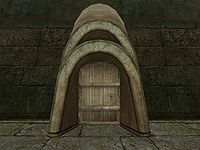 Near the bed that is screened by guar skins is a stool, on top of which lie 11 gold coins.